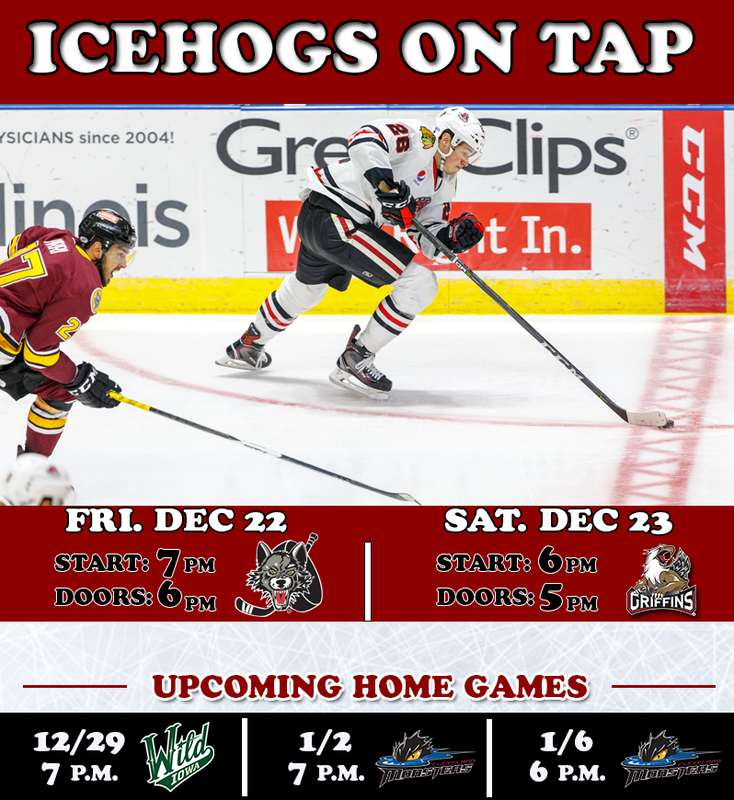 ROCKFORD, Ill. – The Rockford IceHogs return the BMO Harris Bank Center for back-to-back weekend games against the Chicago Wolves and Grand Rapids Griffins. Friday’s contest features a cooler backpack giveaway (ages 21+), courtesy of Bud Light, and Saturday’s tilt includes free bomber hats, courtesy of Pepsi. Cooler Backpacks: The first 1,000 fans ages 21 and older will receive a free cooler backpack, courtesy of Bud Light. Santa Claus is Coming to Town: Santa Claus will be in attendance Friday spreading holiday cheer throughout the IceHogs game. Fans can stop by to visit and have their picture taken with Santa in the Kids Korner, which is located on the concourse level of the BMO Harris Bank Center. Blues Flame Lounge Pregame Party (presented by Vintage @ 501): Fans ages 21 and older can kick-off their weekend festivities with a Pregame Party at the Blues Flame Lounge, located on the BMO Harris Bank Center concourse. Friday’s event begins with live music from Andrew Robinson at 5:15 p.m. and will also feature free appetizers and happy-hour specials. NOTE: Guests must have a ticket to Friday’s game to attend the Pregame Party. Those attending must enter the arena through the upper-concourse level entrance on Elm Street (near the Box Office). Illinois Lottery Cup: The IceHogs and Wolves will square off in the fifth Illinois Lottery Cup matchup of the 2017-18 season. The Wolves currently boast a two-point edge in the current Lottery Cup standings with a 2-0-1-1 record against the Hogs this year. Bomber Hats: The first 1,500 fans through the doors on Saturday will receive a free IceHogs bomber hat, courtesy of Pepsi.